An Iraqi human rights team has gone to the city of Falluja to investigate the use of white phosphorus as a weapon by US forces, a minister has told the BBC. Acting Human Rights Minister Narmin Uthman said her staff would examine the possible effects on civilians. The substance can cause burning of the flesh but is not illegal and is not classified as a chemical weapon. The BBC's Caroline Hawley in Baghdad says it will be some time before the human rights team reports back. Sunni parties demand an international inquiry into the alleged abuse of more than 170 detainees by Iraqi forces in Baghdad. 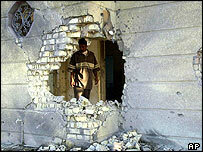 A car bomb kills a US marine in Karmah, 80km (50 miles) west of Baghdad. Italian TV station Rai alleged last week that the US had used phosphorus against built-up areas, and that civilians were killed. The report sparked fury among Italian anti-war protesters, who demonstrated outside the US embassy in Rome. The US initially said white phosphorus had been used only to illuminate enemy positions, but now admits it was used as a weapon. BBC defence correspondent Paul Wood says having to retract that denial is a public relations disaster for the US. A Pentagon spokesman, Lt Col Barry Venable, confirmed to the BBC the US had used white phosphorus "as an incendiary weapon against enemy combatants" - though not against civilians, he said. He said earlier denials had been based on "poor information". The US-led assault in November 2004 on Falluja - a stronghold of the Sunni insurgency west of Baghdad - displaced most of the city's 300,000 population and left many of its buildings destroyed. San Diego journalist Darrin Mortenson, who was embedded with US marines during the assault on Falluja, told the BBC's Today radio programme he had seen white phosphorous used "as an incendiary weapon" against insurgents. However, he "never saw anybody intentionally use any weapon against civilians", he said. White phosphorus is highly flammable and ignites on contact with oxygen. If the substance hits a person's body, it will burn until deprived of oxygen. Globalsecurity.org, a defence website, says: "Phosphorus burns on the skin are deep and painful... These weapons are particularly nasty because white phosphorus continues to burn until it disappears... it could burn right down to the bone." Britain's Defence Secretary John Reid said UK forces had used white phosphorus in Iraq, but not as "anything other than a smokescreen to protect our troops when in action". The UK Ministry of Defence said its use was permitted in battle in cases where there were no civilians near the target area. But Professor Paul Rogers, of the University of Bradford's department of peace studies, said white phosphorus could be considered a chemical weapon if deliberately aimed at people. He told the BBC: "It is not counted under the chemical weapons convention in its normal use but, although it is a matter of legal niceties, it probably does fall into the category of chemical weapons if it is used for this kind of purpose directly against people."